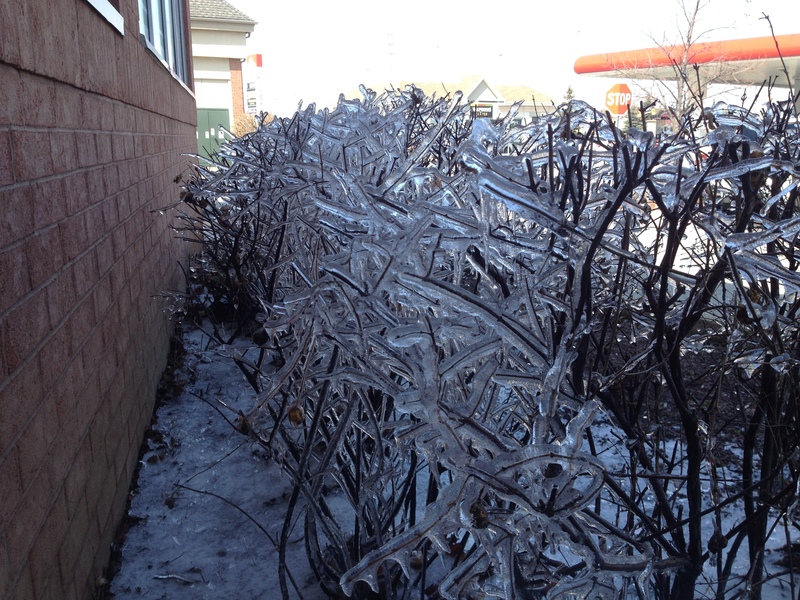 While beautiful to look at, freezing rain is one of the most hazardous types of winter precipitation. Accumulations of a tenth of an inch of freezing rain may not sound significant, but is more than enough to break a few branches on the trees, bring down power lines (and cause power outages), and cause sleet on road surfaces. During the scary freezing rain, the entire area is paved in a sheet of ice at about minus ten degrees Celsius. This is hazardous, especially for the morning commuters, resulting in many accidents on the roads and highways. The drivers of the cars parked in the open find it difficult to even open their car’s doors as they either slip on the glass surfaced floor or the doors are jammed by the freezing ice. These drivers first have to scrape off the ice from the doors and windshields and then drive on glass like roads. The public transport is also affected as the drivers are extra cautious and driving slow on the icy roads. It is compounded by many non-functioning traffic lights due to power outages. The street cars (trams) are delayed due to ice forming on overhead power lines. The trains are delayed, mostly due to failure of the signalling systems. In effect, most people on a freezing rain day reach their offices late. Over a hundred flights are cancelled and many delayed due to the freezing rain. The landing and taxiing surfaces have to be cleared of the ice regularly, causing major delays. The de-icing activity has to be carried out on all aircrafts prior to take-off, contributing to further delay. The problem of ice forming over the wings and tail of the aircrafts is a major concern as it adversely affects the performance of the aircraft, especially at take-off due to reduced lift. This ice has to be removed and the airports in Canada are equipped with deicers. These are vehicles that spray a mixture of a glycol and water, heated and sprayed under pressure, to remove ice and snow on the aircraft surfaces. 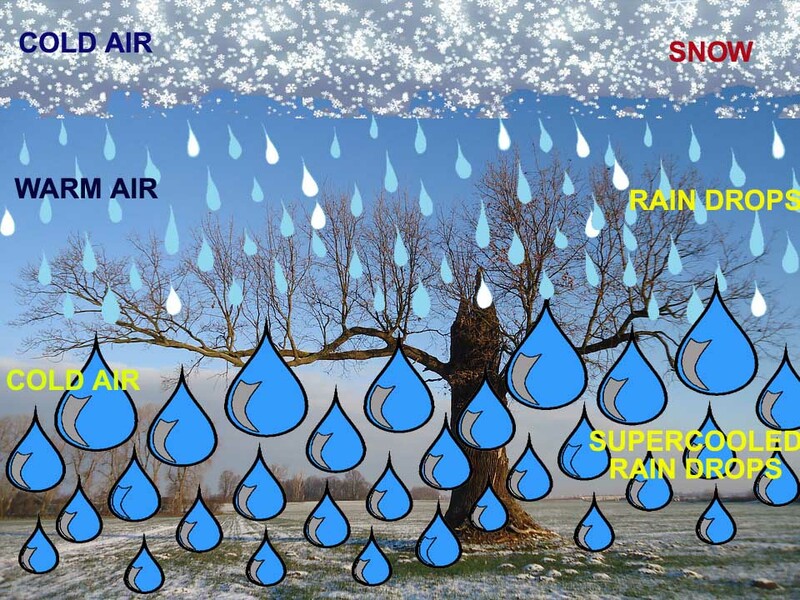 What causes the dreaded freezing rains? Freezing rain develops as falling snow encounters a layer of warm air deep enough for the snow to completely melt and become rain. As the rain continues to fall, it passes through a thin layer of cold air just above the surface and cools to a temperature below freezing point. However, the drops themselves do not freeze, but remain in liquid state due to a phenomena called supercooling. When the supercooled drops strike the frozen ground (power lines, or tree branches), they instantly freeze, forming a thin film of ice. The freezing rain drops on hitting a tree branch or a power line condenses around it as these objects are at a much lower temperature than the supercooled rain drops. As they accumulate, the weight of the tree branch or the power line keeps increasing. Once this weight crosses the strength of the material, it snaps and falls on the ground. In case of a snow fall, the snowflakes even if they accumulate on trees and power lines, tend to slide off them due to their own weight. The freezing rain leave streets under a layer of ice in the morning and results in the closure of many schools, colleges and universities. The students are always very pleased with these ‘natural’ holidays. Many customers experience power outages due to downed power lines or due to tree branches falling on power lines. The crews of the power companies work overtime round the clock to ensure speedy restoration of power. Police services and radio/TV channels warn motorists to slow down due to ice. It is expected of drivers to treat all lighted intersections without power as all-way stop signs. That means any vehicle approaching a failed signal must come to a halt and the vehicle which halted first leaves first. The emergency services always work at full efficiency to cater for many road accidents and to assist drivers who spin off the road. 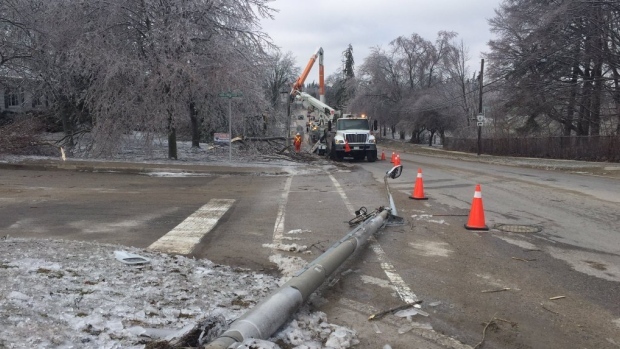 Environment Canada gives sufficient warnings- generally a week – about the impending freezing rain. Various TV and Radio News channels cover it in full details and warns the citizens to be careful and suggest preventive actions. As soon as the rains stop, the salter trucks of the city spread salt on the roads and sidewalks to facilitate melting of the sleet that form on the surfaces. How does salt act as an ice melter? All icy surfaces have a thin layer of water. When salt (Sodium Chloride – NaCl) applied to such surfaces, starts to dissolve. This ionises the salt into positively charged sodium and negatively charged chlorine ions. These ions, in turn, react with water molecules and form hydrated ions (charged ions joined to water molecules). This process gives off heat, because hydrates are more stable than the individual ions. The emitted energy then melts microscopic parts of the ice surface. When an automobile drives over the ice, the pressure helps force the salt into the ice and more of this hydration occurs. The ice-cream makers of the pre-refrigerator days employed the same principle (freezing point depression). The ice and salt mixture ensured that the temperature was well below the freezing mark (zero degrees C), even though the ice melted. Dry Ice or solid carbon di oxide was also used as a more sophisticated alternative. That begs the question why is solid carbon-di-oxide (CO2) called dry ice? This is because the solid carbon di oxide on being heated does not melt into liquid and instead changes directly into the gaseous state by a process called sublimation. One has experienced this phenomenon in J&K. But in Canada it is the kind of detailed measures which have been put in place to ensure utmost public safety and the discipline of citizens at large keeps the life going. On the contrary a foggy day in India may lead to several accidents attributable to many factor. Enjoy life with nature.